I’m still trying to decipher all my mom’s projects, and I’ve gotten through about two boxes, leaving me about twenty or so to go. It would be a lot simpler if the instructions had gotten packed away with the projects, but that really would be too much to ask, and besides, on most of these things, she was just winging it. 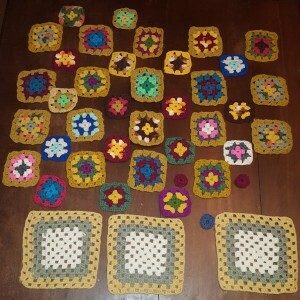 I found 30 of these crocheted blocks, and even I, in my domestic ineptitude, could figure out that sewing them together would yield something that resembled a completed project. And before you go hating on my stitching, it’s supposed to look all chunky like that, because the first few blocks had already been done, and I just copied them. And if it turns out looking too ridiculous, I can always donate it to the animal shelter, because the residents there appreciate my efforts. 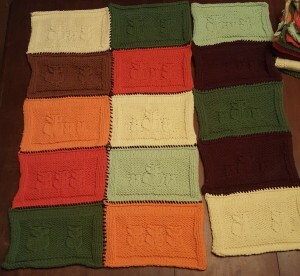 I’m not sure if the afghan pieces were my mom’s or my grandmother’s, but they look so wonky because they’re made with scraps, and the yarn is all different weights. If they’re my grandmother’s, they were made before she started losing her eyesight. Once her vision had deteriorated, she could only crochet in neon colors, so she’d send me these hideous fluorescent multi-colour scarves and my mom would make me wear them and it’s no wonder I have issues. If I can’t come up with some sort of covering, I can always have three potholders and nineteen coasters for when company comes over. My kid’s doll’s had more stylish clothes than I ever did. 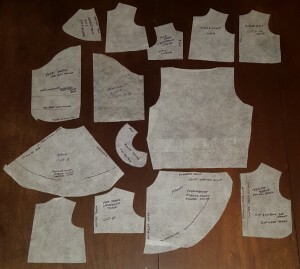 These are some patterns my mom made for doll clothes. Since we have the heat and water cut off at my mom’s old house, I’ve been bringing a few boxes at a time up to our house, cleaning things up, and shipping things out as I go. I’m hoping to be done by Thanksgiving, but at the rate I’m going, Christmas will be more like it.